Most people under the age of 35 probably don't remember a world without e-tax, a system developed by the Australian Tax Office to make it simpler and faster for Australians to complete their tax returns. Before e-tax was introduced in 1999 Australian taxpayers all had to do their tax by hand, or get an accountant involved even for the simplest tax returns. I still remember labouring over the complex and long (130+ pages) pre-eTax tax packs, like this 1995 Tax pack (PDF), a scanned version that has been archived in the ATO website. Even looking at this old tax pack makes me feel jumpy and tense - although these packs attempted to make tax easy, they were still daunting to complete. While early e-tax software was a little rough around the edges and wasn't available for platforms other than Windows (a point of contention for Apple fans), it immediately made tax time much less of a burden. The software has developed a great deal since 1999, become much easier to use and added useful functions such as autofilling employer group certificate information if you have an internet connection. e-tax now caters for a much broader group of taxpayers than when it was first created. Sure e-tax still isn't available for Apple or Linux, but having a product for 85% of the market is far, far better, in my view, than not having one at all. As an Apple user myself, I have no problem with using a secondary PC to do my tax if it saves me time and effort overall (though an Apple version would be a nice-to-have, as would, now, a tablet version). Last week I noticed an announcement that e-tax had just reached 20 million lodgments (as at 31 October this year). So I asked the ATO for some information about e-tax over the years - who is using it and where they live. The information I received provided an interesting glimpse into the history of e-tax. In 1999, the year e-tax first launched, the tool was used by only 27,146 people to lodge their tax. By 2011, the latest available full year of data this had grown by 74 times to 2,600,228 people. The service has grown every year, at an average rate of 43% over its 12 year life. This year looks to be no different, as e-tax lodgments only took four weeks to reach a million, compared to five weeks in 2011. 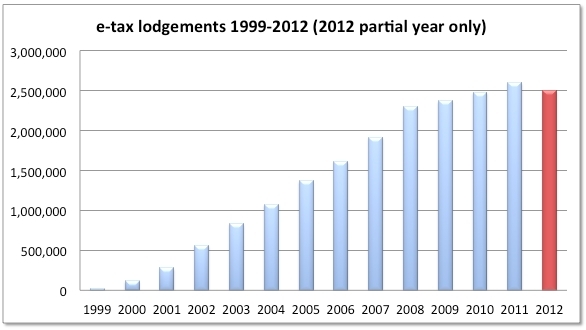 With over 2.5 million e-tax lodgments by the end of October 2012, and as the ATO doesn't 'close the books' until May 2013, e-tax is extremely likely to reach twelfth consecutive years of growth in absolute lodgement terms. However while this is impressive, e-tax growth has slowed substantially over the last four years, to a rate of around 5% per year. This is barely larger than the overall growth in tax returns, which suggests that e-tax has reached a plateau in usage. This isn't a bad thing overall - e-tax has been very successful and isn't in decline, however it has reached a point where the ATO might wish to consider expanding or redesigning e-tax to encourage a new group of tax payers to leap on board, or at minimum adopt a new marketing approach to encourage more people to trial the service for 2013. It was also interesting to look at the demographics for e-tax, which the ATO was able to supply for 2011 (and I hope earlier years will become available as well, to show how the demographics have changed). Gender was very balanced, largely reflecting Australia's population, with 48.9% of lodgements being by males and 51.1% by females. However the average e-tax user was young and earned far less than the average weekly wage. In fact almost two-thirds (65%) of e-tax users were younger than 40 years old, with only 12% being aged 55 or older and half (51%) had an income of $21,600 or less, with only 11% earning $63,001 or more in the 2011 financial year. (see tables below). This might reflect the digital enthusiasm of younger people, where pre e-tax generations may not be as familiar or comfortable using an e-tax system. It may also reflect the more complex tax situations of older and better paid Australians, which may require the aid of accountants. Hopefully e-tax users are 'ageing', just as internet users are. If this is this case, which would need a number of years of e-tax demographics to detect, then it is likely that people who take up e-tax are sticking with it, meaning that the older and better paid groups will become more highly represented over time. The location of lodgers was also interesting, particularly when compared to Australia's population. In absolute numbers, more Queenslanders than Victorians use e-tax, despite Victoria's 20% larger population, and more ACT residents than Tasmanians, despite Tasmania having 50% more people than the ACT. Comparing e-tax usage against state populations at June 2011, proportionately the leader was the ACT with 21.1% of residents using e-tax. Next was Western Australia with 12.9% of residents followed by Queensland with 12.6%. The lowest adopters of e-tax by population were the Northern Territory at 9.4%, Victoria at 9.9% and New South Wales at 10.2%. There may be substantial room for growth in e-tax use in these states, although the ATO might find targeted, rather than national, campaigns would best encourage take-up. Overall my view is that e-tax has been an extremely successful initiative by the Australian government, encouraging millions of Australians to adopt a digital channel to engage with government. The e-tax system itself, while necessarily complex (as is the tax system), has been refined to be usable and a far more pleasant experience than the prior paper-based tax packs. However, like many innovative services and products, e-tax is now reaching a plateau, with little growth in annual usage over the last few years. Assuming that e-tax saves the government money in chasing people to complete their annual tax chore, and therefore the ATO wants to keep growing e-tax use, it is time for the ATO to review the service to understand who isn't using it and why. From this knowledge the ATO can make decisions on how to improve and promote e-tax, giving it a new kick in usage and, hopefully, both make tax time faster and easier for citizens and bring in tax dollars faster for government. The ATO has taken a few steps to promote e-tax already, through media releases, the ATO Facebook page (though the e-tax Facebook page appears to have been deleted) and the video below. These are a good start, however if with these communications e-tax still only has a marginal increase in usage this year, clearly more will need to be done to boost e-tax to the next level. It was so interesting to look at the demographics for e-tax, Hopefully e-tax users are 'ageing', just as internet users are.